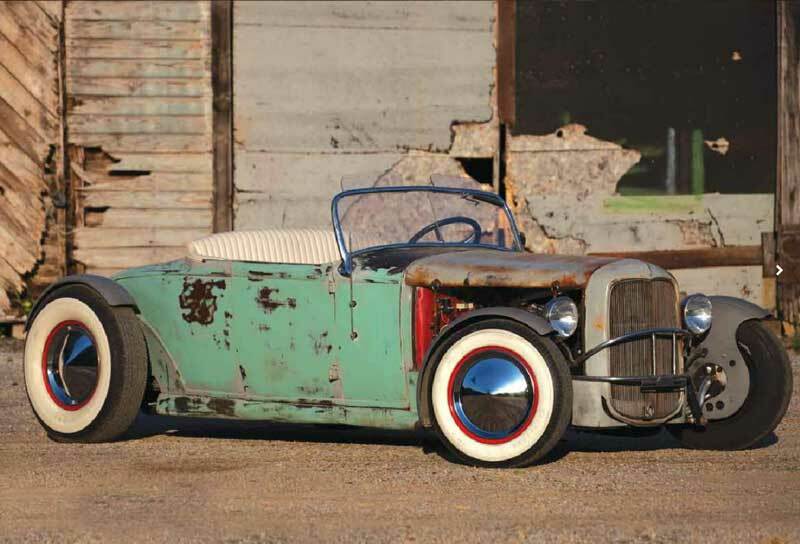 Now, this is a Cool Piece of Little Nostalgia that i would love to own, but its all available to the public if you make a bid on the Auction that is coming up, The Rodders Journal did a write up on this cool Flathead powerd Roadster and I wanted to share it with you lot. It’s a rare opportunity to own a bona fide hot rod survivor. But that’s just what Auctions America is offering when the flathead-powered Model A Ford “Unknown Roadster” (TRJ #61) crosses the block at their upcoming California auction. It’s one of several historic rods and customs (some of which have also graced our pages) consigned for the event. If you have the opportunity to be there July 31st through August 2nd at the Los Angeles Marriott Burbank Airport Hotel, it’s one you won’t want to miss. The Unknown Roadster earned its moniker because despite its early- to mid-’50s design and construction, no one has uncovered any history prior to 1962. Styling cues like the deeply channeled body and cycle fenders lend an East Coast flavor, while other details like the ’40 Ford dash, roll pans, louvers, and nerf bars hint at a West Coast ’50s show rod past. To add to the mystery, a 1955-issue dime is affixed to the center of the steering wheel, possibly marking the date of the little roadster’s completion. Bob Conner originally discovered it in a lean-to in Colorado around 1970. It took nearly 20 years for him to purchase the old Ford, and shortly thereafter Colorado hot rodder Gary Vahling took ownership. Gary was able to piece together a little bit of history, including the possible identity of a previous owner, a man named Bob Flager, and a 1962 photograph taken by Fort Collins hot rodder Ed Koski. Before long Gary’s brother Frank bought the car and installed a fresh flathead before selling it to Greg Hopkins of Dothan, Alabama. Our feature in TRJ #61 chronicled Greg’s journey driving the roadster on its solo maiden voyage from Colorado to Alabama. He snapped dozens of artful photographs as he traversed the states on the back roads and “blue highways.” We had the opportunity to see the Unknown Roadster in action when Greg brought it to Baltimore for our TRJ Revival last year. He drove it to every rod run, cruise, and party we hosted–and the crowds gathered everywhere he went. More recently he installed a Vern Tardel-built 286-inch flathead with a Cyclone 3×2 intake and heads, a four-inch Merc crank, and an Isky full-race cam–all hooked to a venerable 3-speed toploader. In addition to our story in TRJ, the roadster was featured in Pat Ganahl’s Lost Hot Rods II and Volume 10 of Mark Morton’s Hop Up annual. But the next chapter will be written in just a few weeks when it crosses the auction block in Southern California. We’re excited to see where it ends up, and hope to see it out on the road again in the near future. And in this day and age, we don’t doubt more of its history will come to light as time goes on. The Auctions America California sale is quickly earning a reputation for featuring hot rods and customs fitting of its Southern California location. In addition to the Unknown Roadster, Gene Winfield’s custom ’35 Ford shop truck is being offered following its well-documented resurrection by Texas’ Hatfield Restorations. And there are a number of other former TRJ feature cars crossing the block as well, including Bill Layman’s Ronnie Dragoo-style chopped, Cad-powered ’54 Merc and the Jackman Brothers’ famous Deuce sport coupe clone, built by Harry and Tom Jackman. Over 400 cars will cross the block at Auctions America’s California sale, and you can click here to see a complete list and photos of them. There are offerings representing a broad range of eras and styles–and fitting a broad range of budgets to match. We hope to see you in Burbank later this month, and if you won’t be there to see the excitement firsthand, you can catch the highlights by tuning in to NBC Sports Network August 1st and 2nd. This entry was posted in Blog and tagged av8, channeled rod, classic, flathead, hot rod, moon caps, Mooneyes, nerf bars, nhra, roadster, side valve, vhra, vintage.